The Chicago Transit Authority has announced plans to relocate Chicago Card readers on buses from the left of the front door to the front of the farebox equipment, ending its five-year “Go Lane” experiment. 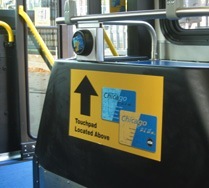 In 2005, the CTA relocated the Chicago Card readers opposite the driver in an effort to speed boarding. The stated goal of the program was to allow Chicago Card users and Transit Card or cash users to board buses simultaneously. Yet the setup was not without its numerous flaws. With the exception of CTA’s Nova LFS bus fleet, most bus entrances were not wide enough to accommodate simultaneous boarding. Furthermore, the Chicago Card readers did not contain a screen readout to allow riders to check their card’s balance or verify that their card properly scanned. According to a report in the Chicago Tribune , the move to eliminate the “Go Lane” was spearheaded by the bus drivers union. The frequent occurrence of failed card reads, communicated to riders only through an obscure system of beeps and lights, regularly required drivers to call boarding passengers back to the front of the bus to rescan their card. The practice would frequently hold up boarding and lead to disputes between drivers and riders. The CTA will begin repositioning the Chicago Card readers on its buses over the course of the summer, beginning later this month with buses assigned to Forest Glen garage. Nearly all of CTA’s buses included the “Go Lane” setup, with the exception of the Optima Opus fleet.